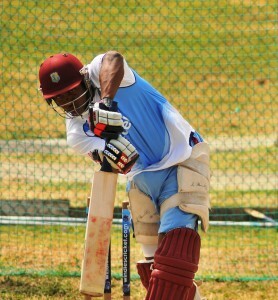 Christopher Barnwell in the nets today in Antigua. West Indies and Zimbabwe resume their rivalry tomorrow with the first of two Twenty20 Internationals to be played at North South in Antigua. There have been changes made to the West Indies line-up with Lendl Simmons, Kieran Powell and Kemar Roach out and pacer Shannon Gabriel and leg-spinner Samuel Badree in. Captain Darren Sammy is also back at the helm. Guyanese all-rounder Christopher Barnwell, who is also back in the Twenty20 side after 17 months, has said he is eager to make an impact against Zimbabwe. Barnwell made his debut against Pakistan in 2011 and was dropped later that year after flopping in four matches. He has been recalled after a successful Caribbean T20 season, where he produced several match-winning efforts for runners-up Guyana. Barnwell scored 245 runs in eight matches and also took six wickets. Badree, who was part of the victorious†World Twenty20 team in Sri Lanka in October 2012 said that West Indies would carry the momentum of the ODI series into the Twenty20 matches. Badree, 31, played his first T20 international last year against New Zealand and has picked up five wickets in six matches. Zimbabwe will be hoping for a complete team effort to change their fortunes after losing the One-Day International series 3-0. However, good performances from the likes of Hamilton Masakadza, Malcolm Waller, Brendan Taylor and Visu Sibanda could mean the difference between a good showing and another series whitewash. Zimbabwe (squad): Vusi Sibanda, Hamilton Masakadza, Brendan Taylor (capt), Craig Ervine, Malcolm Waller, Regis Chakabva, Chamu Chibhabha, Tinotenda Mutombodzi, Natsai M’Shangwe, Kyle Jarvis, Chris Mpofu.